I’ve done some digging and discovered this first chapter of a new Mythical 9th Division story. It was an aborted beginning for book 2 – Terror of the Deep. I still love Timonen and his niece together. “I’m so bored I might eat my own feet,” said Timonen, thumping his head with his huge hands. Albrecht continued to upload new books onto his RoAR. Albrecht and Timonen had spent the past three months living in the secret caves of their ancestors, high in the Himalayan mountains. They’d planned to rest and have a spot of ‘yeti time’, but Timonen was feeling the strain of having nothing to do. He’d exhausted the possibilities of herding yaks. He’d learnt to make momos, which were supposed to be dumplings, but in his hands ended up the size of footballs. He was definitely ready for a new mission. “I’m sure you do,” he said. Suddenly a chain of small bells rang out above his head. Attached to a thin cord on the ceiling of the cave they were an early warning system, triggered by someone or something’s approach. “Saar back already?” said Timonen. Timonen rubbed his hands in excitement. “You wait here then,” he said, pushing Albrecht back to the ground so he could beat him to the entrance. Albrecht threw his backpack into place, returned the RoAR to its compartment and waited. “Uncle Timley,’ cried a young yeti’s voice. The echoes reverberated down through the cave, shooting back and forth through Albrecht’s ears. He covered his eyes. Peace was over. Timonen stomped back through the cave with an expression as dark as bat droppings. 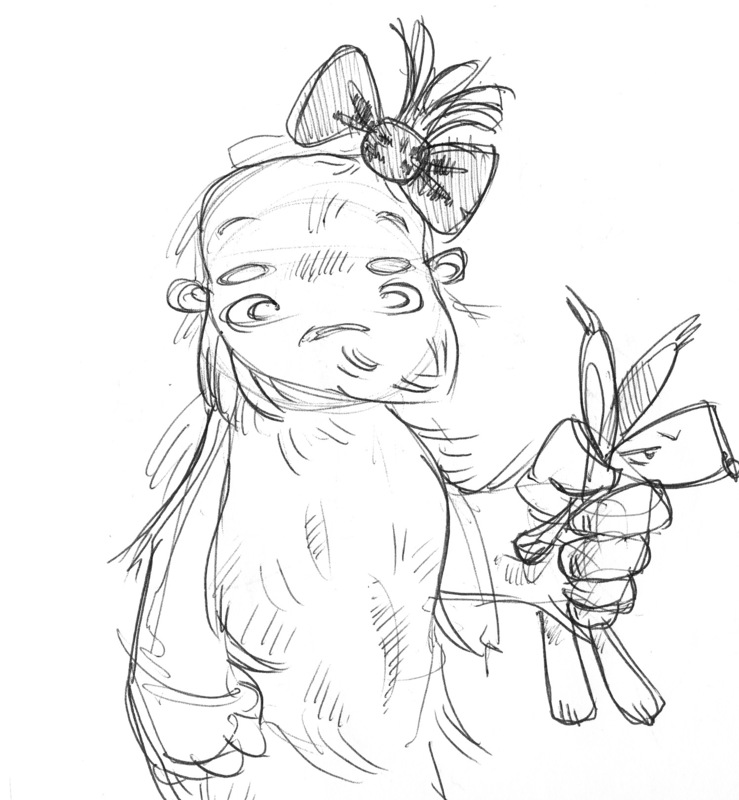 Hanging from his shoulders was a tiny yeti, a red bow tied to her head. The giant yeti mumbled something bleak and unrepeatable. “Is this Albrecht?” asked a voice from further down the cave. “Yes,” grumbled Timonen. The young yeti on his back stuck her fingers in his ear. Albrecht moved to see past his friend and was confronted with the sight of a yeti even larger than Timonen. He had always thought Timonen was the biggest yeti of all. He had clearly always been wrong. “Hello…” said Albrecht cautiously. He held out his hand in greeting, and it was soon engulfed in an enormous, paddle-like palm. “Tumtum,” said the enormous yeti. “She’s my sister,” said Timonen. “My daughter can look after herself in combat,” said Tumtum. Huffy was now pulling Timonen’s cheek skin in and out. “Timonen’s already agreed to it,” said Tumtum. Timonen nodded meekly. Big sisters can turn their brothers to jelly when necessary. Tumtum pointed to the cave entrance. Timonen’s eyes drifted to the wall. He knew Albrecht would be better prepared for receiving orders. “And her nappy needs changing at least four times a day,” continued Tumtum. As if on cue, the waft of a rancid full nappy blossomed to fill the cave. Albrecht sighed and looked to Tumtum. “I’ll show you what to do,” she said, smiling. Huffy danced playfully around a clump of trees at the edge of the forest, swinging her cloth yak back and forth by its legs. Albrecht collapsed down at the base of a tree. Albrecht defiantly switched on his RoAR and scrolled through its options to find a story about homesick penguins. “You wouldn’t do this to a friend,” he said. The young yeti charged out of the forest and out of sight. Albrecht pointed in her direction. “You should probably go after her,” he said. Timonen clenched his fists, growled at Albrecht and stomped off. Luckily, she hadn’t gone far. “Oi, Huffy,” he shouted, seeing the young yeti hurtle down the mountainside. “Come get me, Uncle Timley,” she shouted back, bundling ever onwards. Timonen rolled his eyes. “Why me?” he muttered. He ran through the trees, branches snapping as his wide shoulders caught hold of their ends. Out of the cover of the forest, the mountainside dipped into lush green hollows and the two yetis were bathed in bright sunlight. Each mammoth step counted for forty of Huffy’s and he soon caught her, scooping her up in one of his giant hands. Timonen threw his niece into the air, her gurgles of joy splurting out as she landed happily back in his arms. She giggled and poked him in the eye. Timonen laughed aloud, even though he was in quite a lot of pain. But suddenly Huffy’s joy turned to tears. Her wide smile slumped and transformed into an angry howling open mouth. “Baboooooooo,” she wailed, her piercing cry echoing down into the valley. Timonen finally realised her toy yak was nowhere to be seen. “Baboo,” she said, her eyes red with tears. Timonen lowered her to the ground and crouched down to ask her a serious question. “Now where did you leave it?” he asked. Huffy’s bottom lip trembled as she shook her head. She couldn’t remember. Timonen took Huffy’s hand and walked back into the forest. “It must be somewhere around here,” he said, scouring the floor. Huffy led him through the trees as though she remembered where she might have left it. He let go of her hand, thinking she was much closer to the floor than him and more likely had far better eyesight. Before she’d gone too far, Timonen caught scent of something incredibly tasty. She was digging around at the base of a large pine tree, flicking pine needles back and forth. “Is he…” said Timonen, his focus drawn towards a large piece of meat hanging from a low branch. It was calling to him in a way that only food could. His eyes misted over and not once did he question why a prepared piece of meat was lying waiting for him. But he was Timonen, after all. As he lifted the meat from the branch, a thick metal rope snapped tightly around his leg. With great aptitude and an amazing grip, Timonen kept hold of the food while he shot upwards into the air, not coming to rest until he was dangling upside down at the top of a very tall tree. “Go and get Albrecht,” he shouted. “Why are you up there?” she replied, peering upwards. Huffy started to cry, and even up in the top of the tree, Timonen winced at the sound. Huffy didn’t want to stop crying. She wailed and bawled and screamed and choked. Timonen clutched his face. Blood was rushing the wrong way through his body and a screaming toddler was the last thing he wanted. At that moment the screaming stopped. He looked down again and his heart stopped. Huffy was gone.